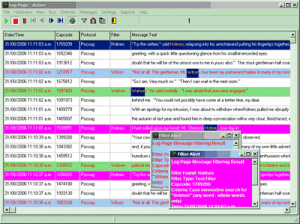 A range of paging software applications for specialized paging requirements including message dispatch, message logging, message filtering and rebroadcast. LogPage is a Windows based application used to log pager message traffic over a Pocsag or Flex paging network directly to a PC or computer network. It is available in single PC or networked client/server versions. A powerful and easy to use reporting engine is included in the Interceptor software to enable the user to develop customized reports of message traffic based on the stored message database. The user can set multiple criteria for each report in a similar manner to the filtering criteria. Each report can be stored as a report template and re-used many times. The results of each report query may be displayed on screen and can be saved as a .CSV file which can be opened and analysed in a spreadsheet program. The user can also set the program to run reports automatically at certain time intervals (days or hours) and send the results as attached .CSV files by email to an unlimited number of email addresses.